2. Create a script file (.bat) to put your computer to sleep. 3. Create a script file (.bat) to wake your computer. 4. Schedule your computer to sleep and wake at a certain time. The first step is to disable hybrid sleep and/or hibernation on your computer. Why would you want to do this? Hibernate is a power-saving feature that saves your machine’s state (including unsaved documents, program states, etc.) 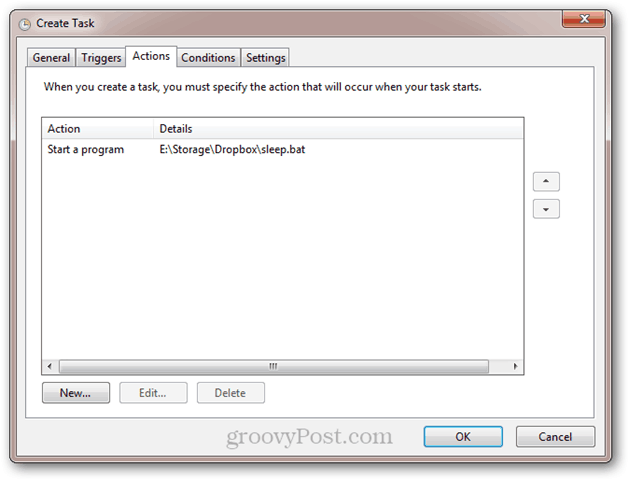 onto your primary hard disk instead of onto the RAM (as sleep does.) The tradeoff is slower resume time, but less power draw. 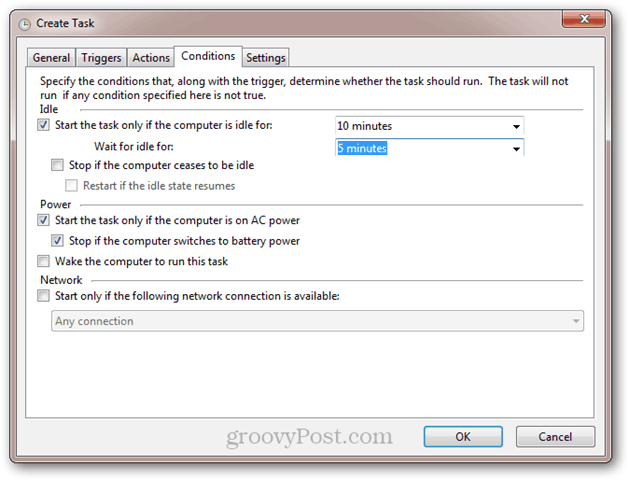 This is important for laptops with batteries, but not so much for desktops. Hybrid sleep does both—it saves open documents and application states into the memory and the hard disk. This is so you won’t lose anything in case of a power outage. 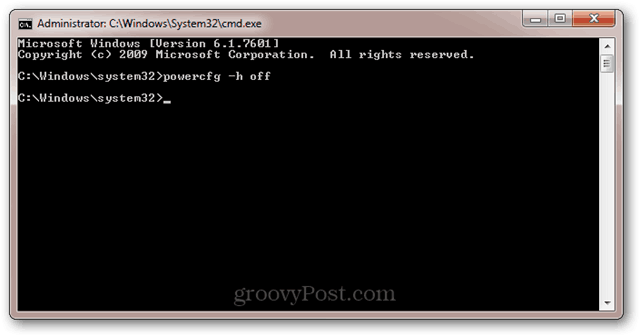 Open a command prompt as an administrator. 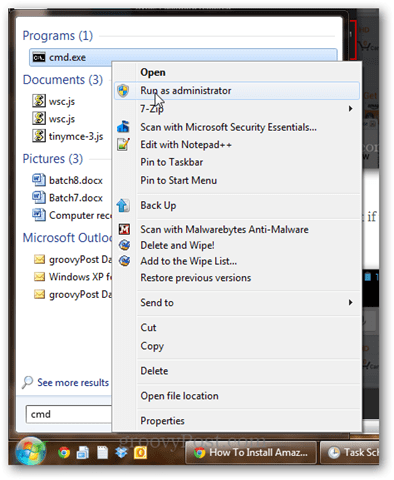 To do this in Windows 7, click the Start button, type Cmd and then right-click cmd.exe and choose Run as administrator. Type powercfg -h off and press Enter. If the command was successful, then you’ll get no error messages. If you get the error message: “You do not have permission to enable or disable the Hibernate feature” then re-read the previous step about running cmd.exe as an administrator. Now, like a bear addicted to espresso, your computer will no longer hibernate. It’ll sleep, but it won’t hibernate. Mission accomplished. The way we’ll put your computer to sleep is by running a script (.bat) that will initiate the sleep command. 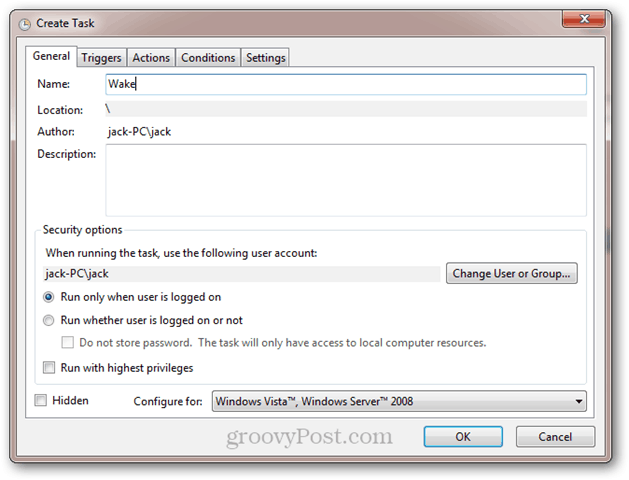 By using a batch file, you can add other parameters and commands to it later without rejiggering your Windows Task Scheduler task. Got it? 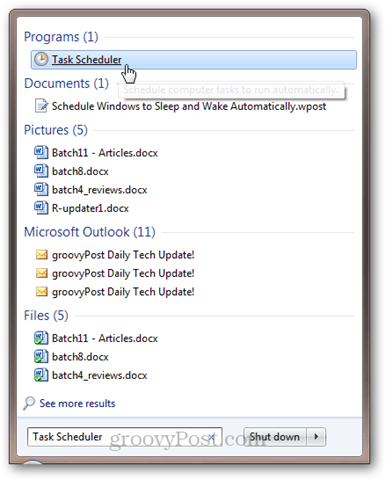 If not, you can just download the sleep and wake batch files I already created by clicking here. There isn’t a command line command to wake your computer. That’s because if you are in a position to be running commands, then your computer is, of course, already awake. But what we can do is create a batch file with something arbitrary in it and then tell Windows Task Scheduler that it can wake the computer to run it. So, go ahead and make a batch file that does something like “echo Hello!” and then save it as wake.bat. 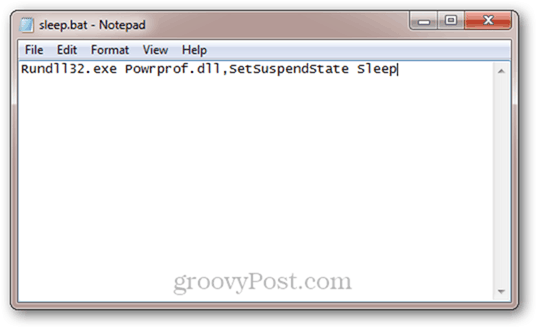 Again, you can also just download our sleep / wake batch files here. Now that we have batch files to sleep and wake our computer, all we need to do is tell Windows when to run them. 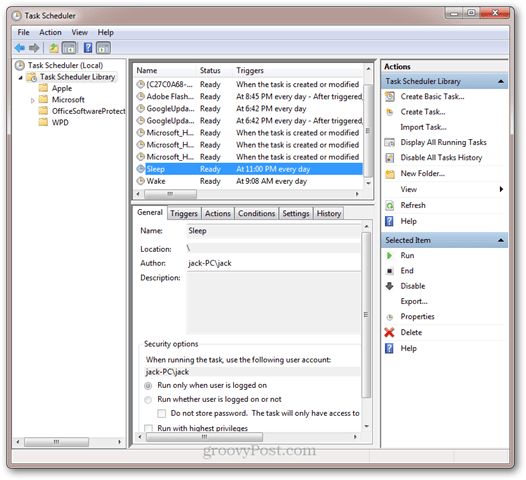 Run Task Scheduler. The fastest way to get to it is by clicking the Start button and typing Task Scheduler. In the Triggers tab, click New. 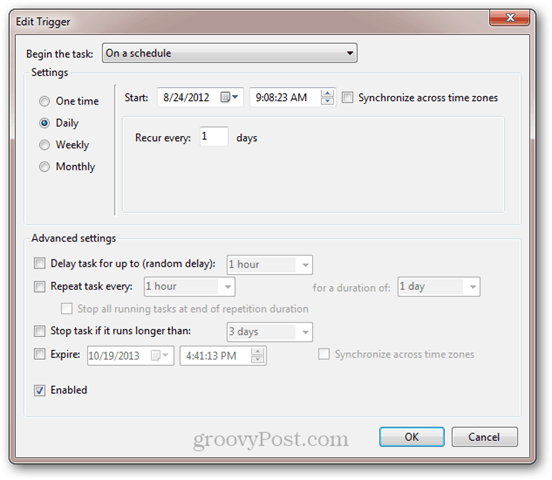 Set the task up to begin “On a schedule” and choose daily and plug-in the time when you want it to run. Click OK. Your trigger will be enabled. Next, click the Actions tab and click New. 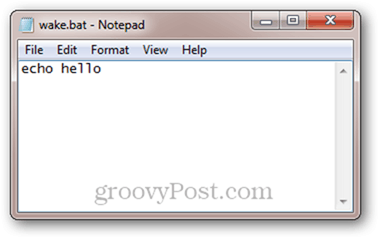 Set the action to “Start a program” and browse to your sleep.bat script. Click OK.
Click OK. You’re done with this part. If you want to test it out, you can add a new trigger that sets it in motion 1 minute from now. Next, let’s make a Wake task. 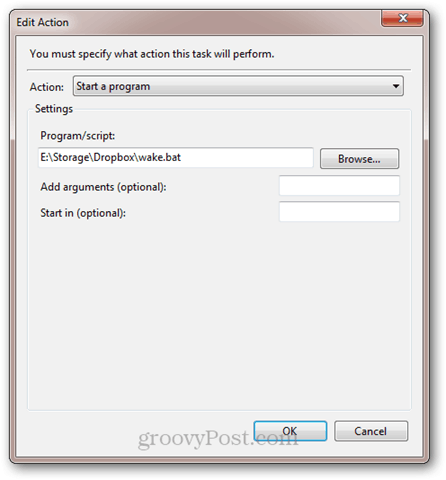 Click Action and Create Task, and name it Wake in the general tab. 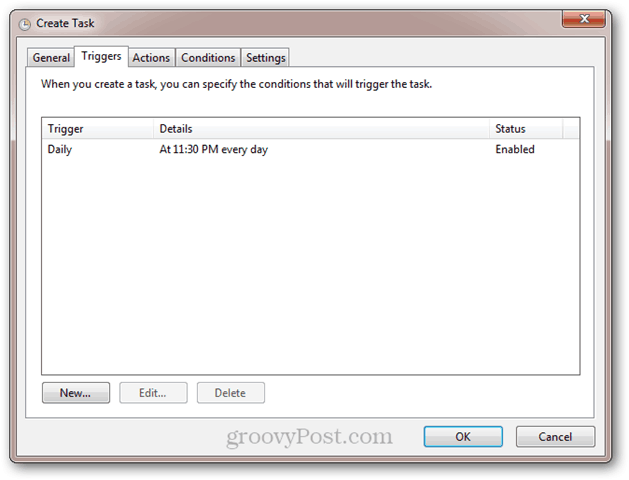 Then, create a daily trigger with the time you want to wake your computer. Next, go to the Actions tab and make an action to run your wake.bat script. Now, go to the Conditions tab. 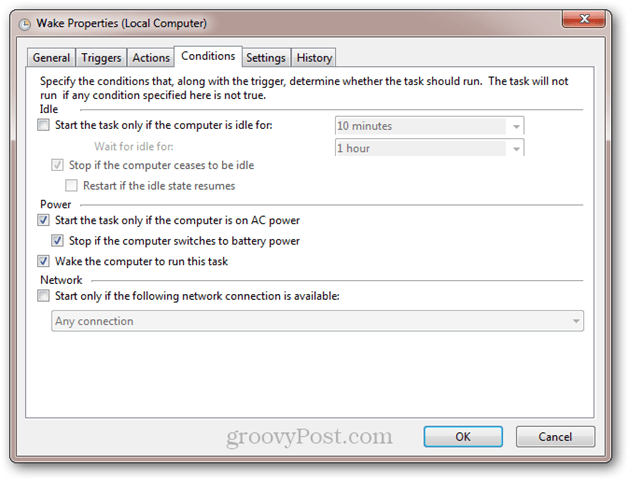 Here, make sure that the “Wake the computer to run this task” option is checked. Click OK. Now, your computer will wake and sleep at the scheduled times. Enjoy!